The ML series of raschel machines is setting the standard in the fashion sector, as well as in the production of traditional garments. With their gauge of E 24, these machines are catering for the continuing trend for light, delicate plain fabrics and lace. 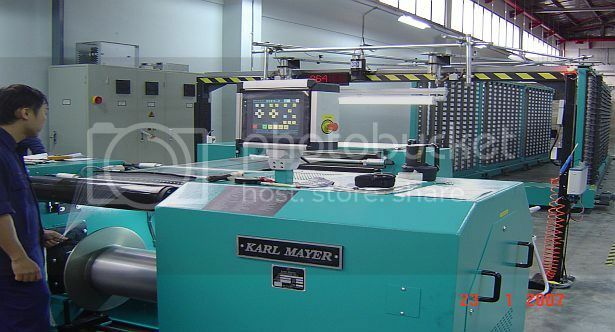 In a working width of 210", these best-selling machines from KARL MAYER are a must for producing saris in particular. The first wide-width multibar raschel machine was delivered to India recently – to the warp knitting mill, Tee Pee Textiles, in Surat, in the state of Gujarat. Tee Pee Textiles and KARL MAYER are inviting any company that is interested to the inauguration and demonstration of this new machine on 26 May. KARL MAYER is expecting customers to attend from all over India. The Managing Director, Arno Gärtner, and Oliver Mathews, the Sales Director of the Warp Knitting Business Unit, will welcome the guests. During the demonstration, the ML machine will be producing two different sari fabrics, each consisting of four panels next to each other in a gauge of E 24. Highly productive with a width of 210"
The machines in the ML series have an excellent cost:benefit ratio. 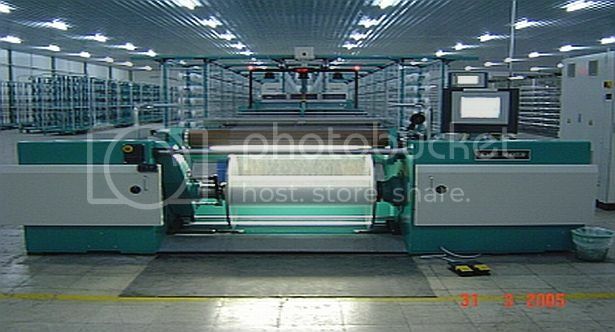 At a width of 134", they can reach speeds of up to 900min-1, and the machines having a width of 210" are extremely productive, especially when producing sari fabrics – four 50"-wide fabric panels can be produced next to each other simultaneously. The working width of 210" is therefore ideal for producing this traditional Indian style of dress. In addition to being fast, the multibar raschel machines are also user-friendly, accurate and flexible. The pattern can be changed with very little time and effort. This enables customers to produce even small batches efficiently, and react quickly to changing market trends. 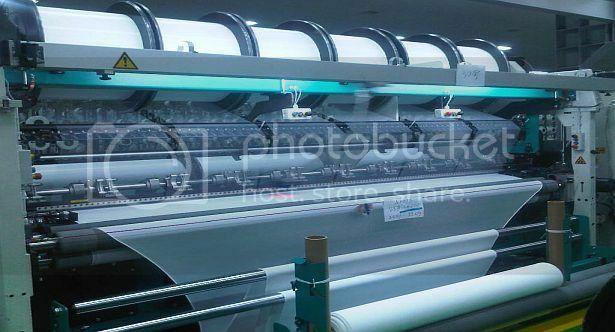 The fabrics produced on the Multibar Lace machines are delicate and more or less open, and feature continuous net grounds. The pattern elements, which are usually floral and decorative, are worked into the ground in sweeping lines to create striking effects. Typical of sari production are simple tulle grounds and, for example, Paisley patterns with sequin embroidery or large decorative flowers and leaves with a folklore look. The panels can be decorated with a narrow, curved border – to produce an attractive hem without the need for any making-up. Two guide bars tricot machine with high performance from Karl Mayer for universal application, from light tulles to heavy raised velour .This model is also suitable for very low stitch densities and coarse gauges as well. Below are some of applications that can be produced in the HKS 2 tricot machine. 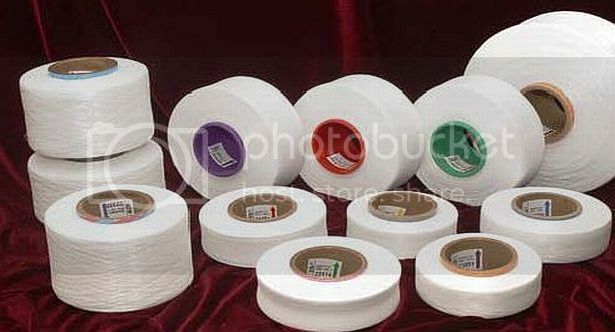 All kind of tulle fabrics. Ground fabrics for printing / advertising media. High-performance tricot machines with two guide bars from Karl Mayer to produce plain rigid fabrics and elastic fabric as well by fitting the elastic device (tube deviation) for the second guide bar as a replacement tension bar which is used to produce un-elastic fabric,The letter (E) on HKS 2-3 E signify that machine equipped with Elastic device to produce elastic fabrics. 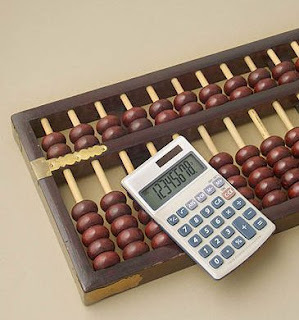 In this case we need to tape a yarn sheet on the warp beam,cut them off and remove,however we need also to calculate how many meters or kilo grams a yarn sheet remain on the warp beam for future used.Following are the formula to calculate the remain yarn sheet on warp beam for Warp Knitting. Metallic yarns are by and large made from strips of a synthetic film, such as polyester, coated with metallic particles. In one more method, aluminum foil strips are sandwiched amid layers of film. Metallic yarns may also be made by twisting a strip of metal around a natural or man-made core yarn, producing a metal surface. 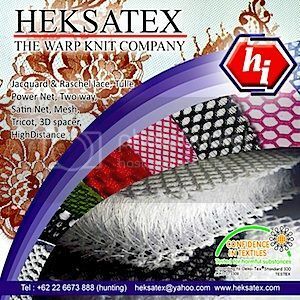 It is made of thin film and supported by nylon or polyester or rayon yarn according to the type of yarn. 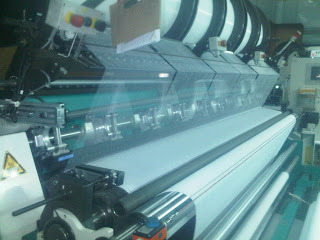 Metallic yarns start as rolls of films or laminations 30" or wider. These wide rolls are slit into narrow rolls 2" to 5" wide. These narrow rolls are gang slit across their whole width to micro widths from 1/128" (.0078") and wider and then taken up on plastic spools for shipment to textile mills. There is a rainbow of colors available from red, blue, green, etc. to gold and silver. Brilliant, reflective colors which add decorative patterns to fabrics. Many metallic yarns knitted into fashionable Raschel and Jacquard fabrics . For added variety, metallic yarns are twisted with other fibers such as wool, nylon, cotton and synthetic blends to construct yarns which add novelty effects to the end cloth or trim. They create all fabrics more eye-catching by adding sparkle. At one time or another, metallic yarns have been used in just about every variety of textiles. 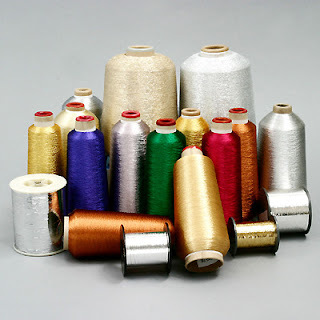 Metallic Yarn is used in manufacturing knitting wears, knit and woven fabrics, embroideries, labels etc. Some end uses have been in automotive fabrics, television front fabrics, bath towels and face cloths, clerical vestments, bathing suits, hosiery, upholstery, hat bands, etc. Also in theatrical clothing, theatre back drops, doll clothing, banners and uniforms. Karl Mayer company has developed an active pattern beam drive for its high-speed lace machines which consists of a tension controlled yarn delivery system.This innovative control principle has already been used in practise by customers operating lace raschel machines. 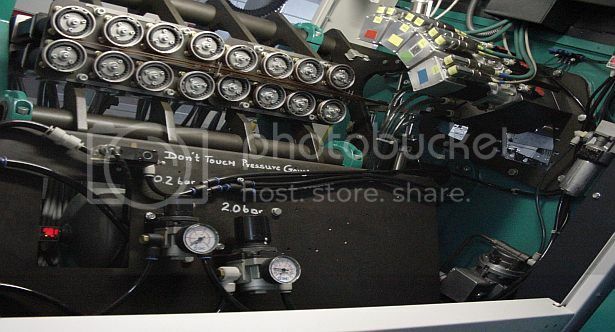 The system consist of a yarn-tension controlled yarn delivery system and can be use with all pattern beams.It is based on the tried and tested servo system,which has been successfully used for many years for driving the string bars.A new and improved version is currently being tested.The changes that are incorporated in this improved version relate to use of a new type of motor and replacing the existing friction control system with toothed wheel for power transmission. From a high performance Raschel machine with four ground guide bars and CFRP bars. This power-net structure for lingerie articles cuts a fine figure.In spite of its puristic appearance and cool touch,this is unsophisticated fabric unveil its true qualities when its comes to such functional features as e.g holding,supporting,shaping and moulding.This stretch textile with specific elastic smoothes out unflattering curves,without restricting or even constricting one’s movements.Not only can the body stylist breathe a sigh of relief but the body can also take deep breath.The filigree mesh openings ensure a sufficient heat and moisture balance.